Your ICB exams and assessments are crucial. You have to complete all assessments and make sure you pass your final exam. When it comes to your ICB exam you will sit down at a specific time, at a specific icb exam centre, with a certain amount of time in which to finish. You get up to four or five chances in a year to write an exam if you are studying via distance learning. You choose your own venue and date that you write. Your assessments are used to see if you understand the work that you are studying. Your formative assessments come in the form of exercises, assignments, and practicals in your Portfolio of Evidence (PoE). Your PoE consists of three tests and two assignments. Formative assessments are used as a way to test your knowledge and help prepare you for your exam. Your three formative assessments count toward 30% of your final mark. Your summative assessment is your final exam. This is to test everything you know and counts the most toward your final mark (70%). You must achieve a minimum mark of 50% in order to pass your final exam. Your overall mark will include both assessments and your final exam, of which you must have at least a combined mark of 60% to pass. When you are done with your assessments, you must include them in your Portfolio of Evidence. What is the Portfolio of Evidence (PoE)? A PoE is your collection of all the work you have done in your formative assessment. You must complete this PoE before your final exam hand it in on the day that you write. Please make sure you finish your PoE as soon as you can so you know where you are struggling and have enough time to focus on that when preparing for your exam. How do you get Your PoE? As soon as you register for a subject on the ICB Learner Portal, your PoE is prepared and sent to you. Your PoE will be sent to as soon as possible. Please note that your PoE will be sent to you by the ICB and not by your college and will only be sent to you after registering on the ICB Learner Portal for your exam. 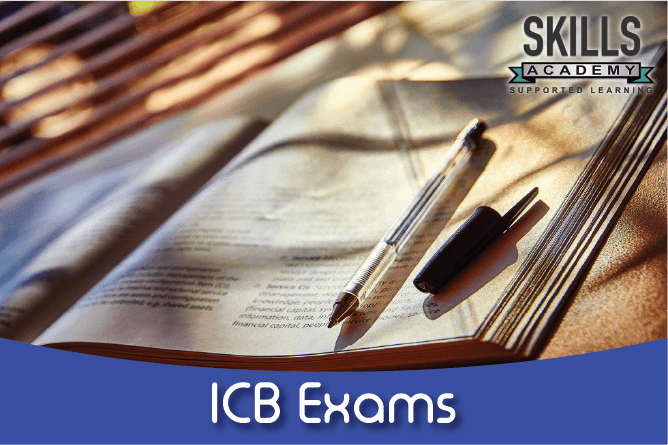 How do you Register for ICB Exams? pay your subject assessment fees (this is to pay for every subject you will write). All of the above mentioned actions can be done though the ICB Learner Portal. The ICB Learner Portal is where you can submit, store, and update all of your information as a student with the ICB. How to Find an Exam and Assessment Centre? If you want to see where all the ICB exam venues are, you can find it on their site. When applying to write an exam on the ICB Learner Portal you can also view all the venues that are available to you there. What if There are no ICB Exams and Assessments Centres Close to me? If you live and work more than 200 km from an ICB assessment centre, then you can apply to the ICB for Private Invigilation. The ICB looks at these requests on an individual basis. The ICB would rather advise you to make use of a recognised assessment centre than make use of Private Invigilation. If there is a new venue close to you the next year, the ICB reserves the right to reallocate you. Exam dates for classroom students take place every month at most colleges if you are a classroom learner. If you are a distance learner you will usually write in February, May, August, and November. Your exam results are released about a month after you have written your exam. What Happens if you Fail Your ICB Exam? You can apply for a re-mark or re-assessment one month after getting your results. You will have to fill in and submit the application form for re-marking and pay your re-mark fee. An assessor and moderator will have a look at your PoE and put together a detailed re-mark report for you. The ICB does not issue qualifications to students since the year 2005. The Finance and Accounting Services Sector Education and Authority (FASSET), who oversees ICB qualifications, will issue your qualification. You will however receive a detailed results report from the ICB. This report is accepted by employers as evidence of your qualification. How Long Does it Take to get Your ICB Qualification? It can take up to three months to get your ICB qualification. The ICB sends your student information to FASSET, who then quality checks all information and allows the ICB to correct any mistakes that were made. Your qualification will then be sent to your nearest college where you can collect it. How do you Know if a Course or College is Accredited? If you would like to know whether a college is accredited to offer ICB courses, you can ask the ICB for their accreditation certificate. The ICB gives every accredited provider an accreditation certificate for every ICB course which they offer. You should check the college’s name, as well as the expiry date on the accreditation certificate. Accredited colleges also have accreditation letters from FASSET, so be on the lookout for that too.